Lancaster, PA and New York :: American Institute of Physics ,, 1968.. Paperback. Near Fine. 188 pp., 4to. Paperback. 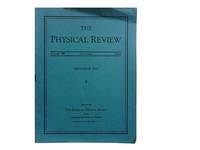 "A Journal of experimental & theoretical physics" Published for The american Physical Society. Containing analytic subject index for 1967, alphabetical subject index, cumulative analytic subject & author indexes to vols 159, 160, 161, 162, 163, & 164, & abstracts of articles in vol 164. Very light shelfwear to covers; light creases to front cover (& front pgs) & sunning to spine. Textblock basically clean & crisp.